Pearls Jewelry Cool Color Mauve(Lapis) & Dark Purple(Wisteria) Swarovski Pearls this is Special Color for Brides or Bridesmaid. Custom Handcrafted Jewelry Necklace Set made with Swarovski Pearls Dramatic historically inspired evening & bridal jewelry with a modern twist. 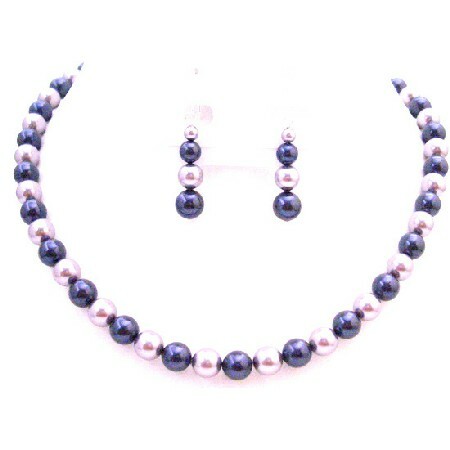 100% Swarovski Mauve & Dark Purple Pearls. Our handmade wedding & bridal jewelry offers you something unique & beautiful. Each piece of jewelry is timeless & made with the finest Swarovski Pearls quality genuine Pearls & beautiful Swarovski.